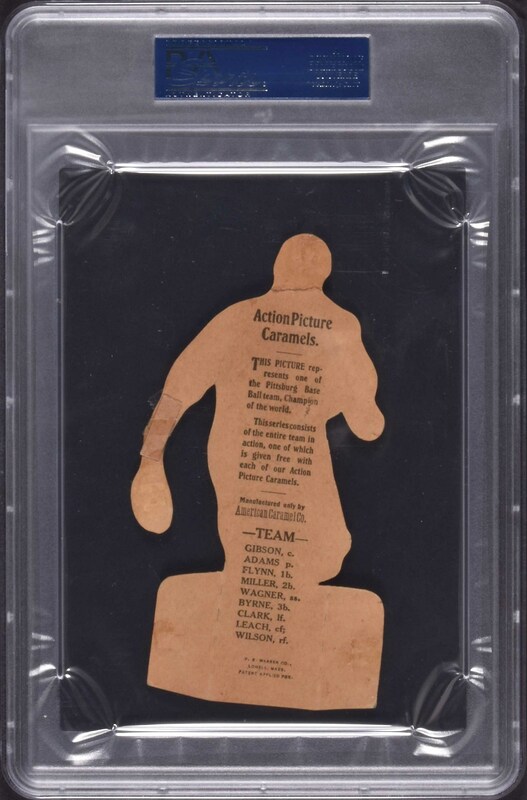 Extremely rare E125 American Caramel Die-Cut of Honus Wagner. Honus Wagner will always be a magical name in the world of baseball cards because of the legendary rarity of his card in the T206 set. Approximately sixty T206 Wagners are known to exist. 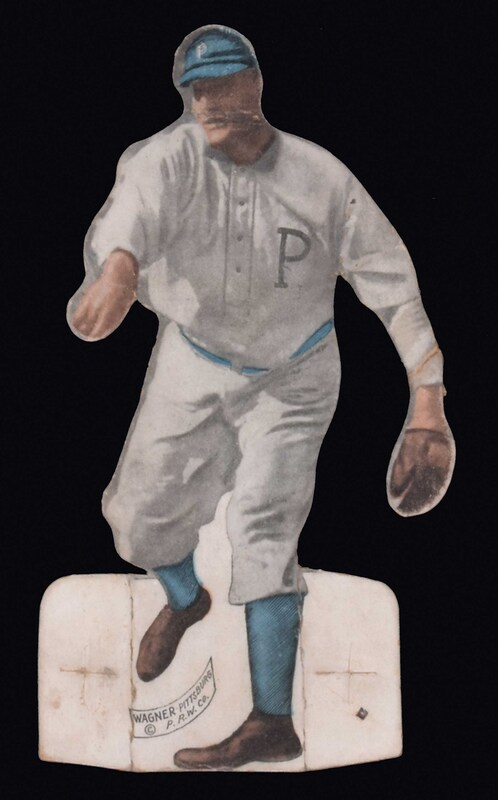 Offered is a card of Honus Wagner (throwing pose), from the American Caramel Die-cut series issued in 1910, which is five to ten times rarer than the T206 Wagner. A second pose of Wagner batting is also known to exist in the set. E125s have always been held in the highest esteem by advanced collectors both for their extreme rarity, as well as for their very striking and unique design. The fragile nature of all die-cut cards and the easily broken flaps at the base of E125s which allow them to stand, make complete, high-grade examples all the rarer. This E125 Honus Wagner has survived complete, with all flaps intact. The stand-up flaps have never even been folded back. Bright and clean, with a crease on the face, a crease on his left arm just above his wrist, and a couple very light surface creases on the top of the arm where it meets the shoulder. 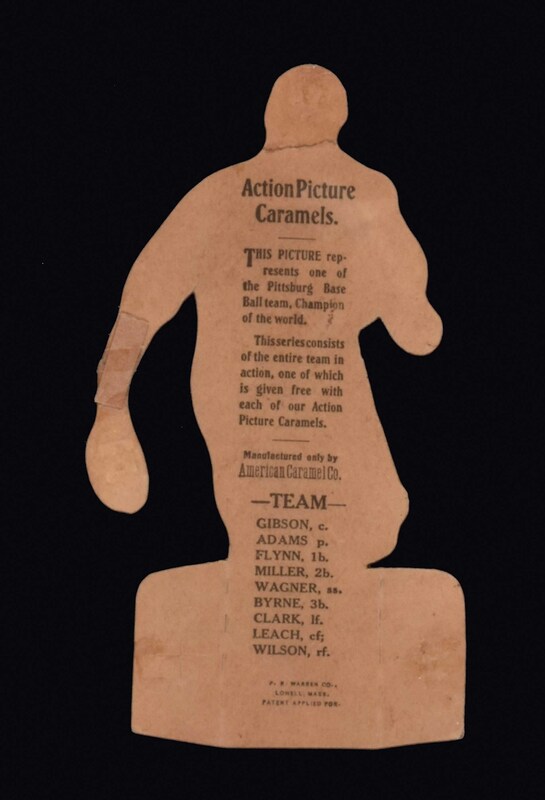 The reverse of the card, which features a complete checklist of the Pirates in the set and advertising for American Caramels, is bright and clean, with evidence of the slightest hint of paper loss from being mounted in an album long ago. Encapsulated by PSA as "Authentic" due to Wagner's left hand being reinforced on the reverse; it is otherwise in Very Good condition. 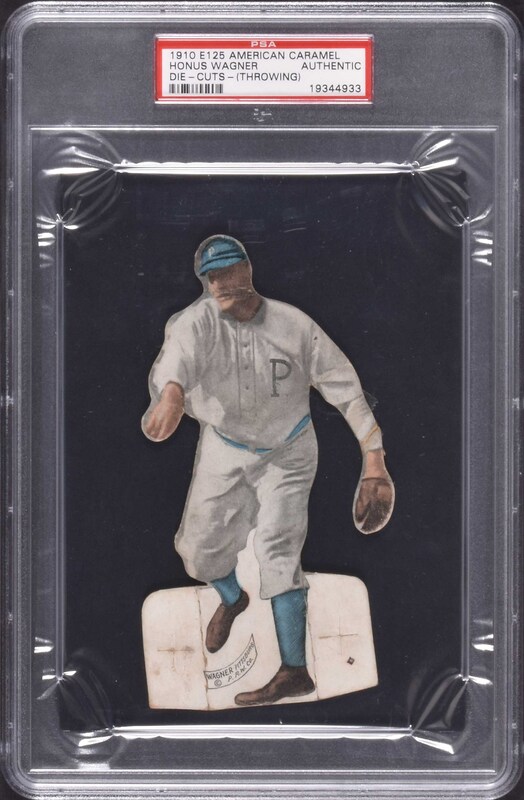 This is a very attractive example of one of the most elusive of all Honus Wagner cards, from one of the rarest and most condition-sensitive of all caramel-card issues. Reserve $1,000. Estimate (open).